The threat of joining terrorist and extremist groups by young Tajik citizens has become the reason of the decision to bring students studying at religious education institutions abroad back to the home country. Otherwise, the circumstances would be irreversible, Melikov believes. Preventive and precautionary measures aimed at preventing involvement of citizens of the Kyrgyz Republic in extremist and terrorist activities, and participation in armed clashes in Syria and other countries in the Middle East continue. At the same time GKNB is working on identification of traffickers and recruiters. We probably shouldn't wait for an investigation to expose the culprits as long as this could damage certain business relations. The Syrian government has long been charging that foreign fighters are joining the battles alongside the opposition rebels, accusing regional countries, such as Turkey, of facilitating the flow of those jihadists into Syria. Pushkov does not exclude that “terrorism can come to those states where it never existed previously. So I would not want the states of the southern Caucasus to become involved in this terrorist activity, but it could happen. 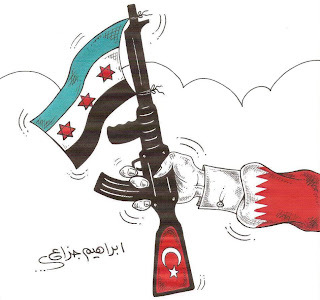 Because total destabilization leads to a situation where some people, especially with the funding of certain fundamentalist groups that are growing by leaps and bounds, on oil and gas in a number of Arab states, may have an idea, but why not try to support extremist tendencies in a particular country in the region, say, in Azerbaijan. I think that's what is dangerous about the Syrian crisis - it can, like cancer, metastasise into other countries. 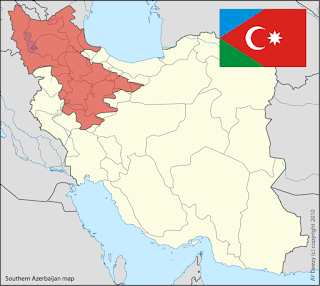 South Azerbaijan is a region in northwestern Iran and groups like the Southern Azerbaijan National Awakening Movement fight for its "liberation". SANAM recently celebrated the 95th anniversary of Azerbaijan’s independence in the country's embassy in Washington with John Kerry and Dana Rohrabacher, who has been campaigning extensively for oppressed minorities in Iran and Pakistan. Coincidentally, Washington now also hosts the new office of the MKO, which is the favorite terror cult of the U.S. government and was therefore removed from the list of foreign terrorist organizations. According to the US ambassador to Azerbaijan, Azerbaijan will play an even more important role in ensuring the European Union's security after the consortium developing the giant Shah Deniz gas condensate field located in Azerbaijan's sector of the Caspian Sea makes a final decision on the gas transportation route to Europe. "Beyond opening a new pipeline, Azerbaijani gas will become even more important for European energy supplies," Morningstar told journalists. The Shah Deniz consortium is considering the Trans Adriatic Pipeline (TAP) and Nabucco West pipeline route for gas export. The consortium will make its final decision in June and a final investment decision by October 2013. 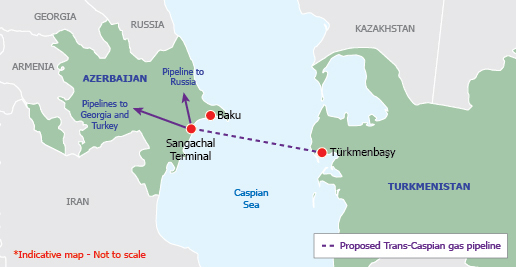 Azerbaijan and Turkmenistan have the right to lay the Trans-Caspian pipeline and the U.S. in general agrees with it. The Galkynysh field, the world’s second largest by gas reserves, will be used to build up Turkmen gas exports to China. The field is expected to produce 25 billion cubic meters of natural gas per year for China, with Turkmenistan’s total gas exports to China planned to reach 65 billion cubic meters annually after the field’s launch, Abdullayev said at the fourth international gas congress held by Turkmenistan. Our respected colleague Mikhail Korchemkin of East European Gas Analysis brought to our attention an intriguing comment contained within the The April issue of Blue Fuel newsletter of Gazprom-Export Global Newsletter. "The construction of this pipeline would mean to spit in the face of Russia and the real risk may be that of a military conflict, in front of which Russia will not pull back." As Mikhail commented: "It does look like the state-controlled Russian giant threatens war with Azerbaijan and Turkmenistan over the pipeline project, doesn't it"? Russia fears the establishment of NATO military bases in the Caspian Region after the withdrawal of the coalition from Afghanistan in 2014 under the pretence of providing regional security. This view was voiced by the head of the Caspian Cooperation Institute Sergey Mikheyev. “We believe that the Caspian region is more and more becoming a node where tension lines of the European continent meet. Apparently, geopolitical interests of many players are crossed here: serious oil and gas resources are concentrated here." Since Kyrgyzstan wants to cancel the current agreement with the U.S. on the Manas air base and is moving closer to Moscow, the United States and its allies are turning their attention to other Central Asian countries. The prospect of a U.S. military base in Uzbekistan was already mentioned in the last Round Up. Azerbaijan will join neither NATO nor the Russia-led Collective Security Treaty Organization (CSTO), but is prepared to cooperate with both, a presidential aide said on Friday. That does not mean Azerbaijan will not alter its position in the future, he added. 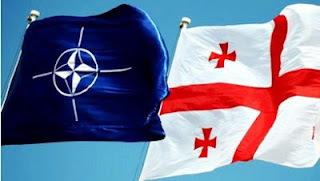 “If Azerbaijan’s national interests require membership of those organizations the country could become a member of NATO or even the CSTO - or remain neutral,” Gasanov said. According to the document, accession into NATO is the main priority of Georgia's foreign and security policy. The attendees of the Symposium are discussing a number of issues like regional stability…and the possible shift of Middle East crises to the Caucasus region. Representatives of the United States European Command Intelligence, high-ranking intelligence officials of Black Sea and Caspian Sea basins countries – Georgia, Bulgaria, Rumania, Moldova, Ukraine, Armenia, Azerbaijan, Turkey, Turkmenistan and Kazakhstan – military attaches and experts take part in the Conference held by the organization of Military Intelligence Department of Ministry of Defence. The Head of Military Intelligence Department of JS of GAF [Joint Staff of the Georgian Armed Forces] Col. Roman Jokhadze unveiled the Conference. The Russian government has banned all Gülen schools and the activities of the Nur sect in Russia. 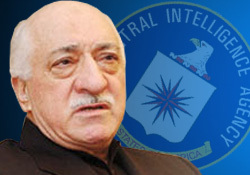 Over 20 Turkish followers of Gulen were deported from Russia in 2002-2004. In 1999 Uzbekistan closed all Gulen’s Madrasas and shortly afterward arrested eight journalists who were graduates of Gulen schools, and found them guilty of setting up an illegal religious group and of involvement in an extremist organization.